To give credit where it is due... Tim completed it. We (Tim I and other OM'ers) had come up with 4 characteristics. We were missing one letter, T (I think). The letters were in a different order. Tim said "add a T". I said "what?". He repeated, "Add a t." I said "I understand the individual words you are saying, but not what you mean." He finally said "Add the letter T and it spells first." I got his "a-ha". Looks like you need FIRST class test to make your code SOLID! All principles in the "FIRST" makes a lot of sense. How do you make sure that the tests that need the database connections run that fast? - introduce test doubles. Also rework the design of your app--many classes that are dependent on the database should really only be dependent on pojos (that you instead inject). 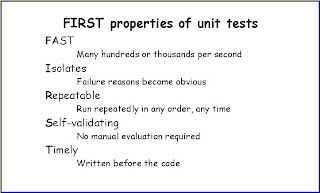 Remember that a goal of a unit test is to determine if a unit works in isolation: is its own logic proper, and does it interact with collaborators properly?